Lentils are super legumes. Due to their high fiber content, they prevent sugar levels from rapidly rising after a meal. They also help lower cholesterol. So everyone should be eating lentils not just diabetics. 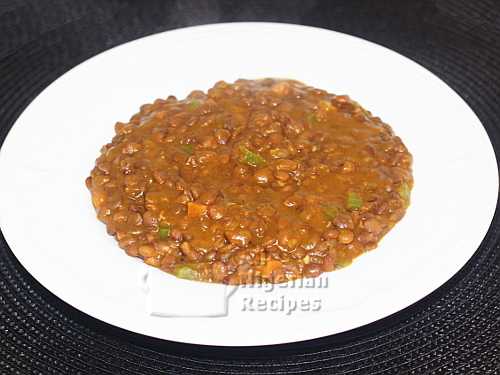 In this recipe, I show how I cook lentils such that it tastes Nigerian. 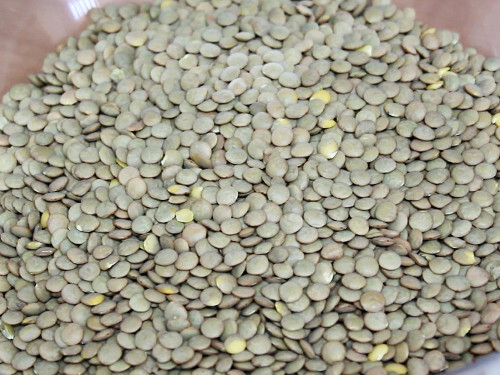 Lentils are known as lentils wherever they are available in Nigeria. Look for them in big supermarkets. The quantities of green pepper, carrots and red onions can be adjusted to your taste and how busy or sparse you want these ingredients to appear in the meal. Rinse the lentils in plenty of cool water. Rinse and dice the green pepper and onions. Scrape, rinse and dice the carrots. Put the lentils in a pot, pour a generous quantity of water because lentils can absorb lots of water. Add the stock cube, black pepper and start cooking. Note: If you have a pressure cooker, use it to cook lentils because they take a while to cook with a normal pot. When the lentils are very soft, add the onions, carrots, palm oil and salt ans continue cooking. When it heats up, add the green peppers. Cover and let it heat up again. Once it heats up again, stir and serve when it has cooled down to a comfortable temperature. Aim to have the lentils poridge a bit watery because when it cools down to a confortable temperature, it becomes thicker. You can serve it like that or with Fried Plantain.